Heat a large pot with oil over medium heat and then add onion and salt/pepper. Cook until softened and then add ground beef, cook until well browned. Put heat to low and add broth, both beans, tomatoes, coriander, chili powder, cumin, chipotles in adobo and tomatoes. Simmer for 45 minutes to an hour, then add lime juice and chopped cilantro. Simmer 15 more minutes and serve. 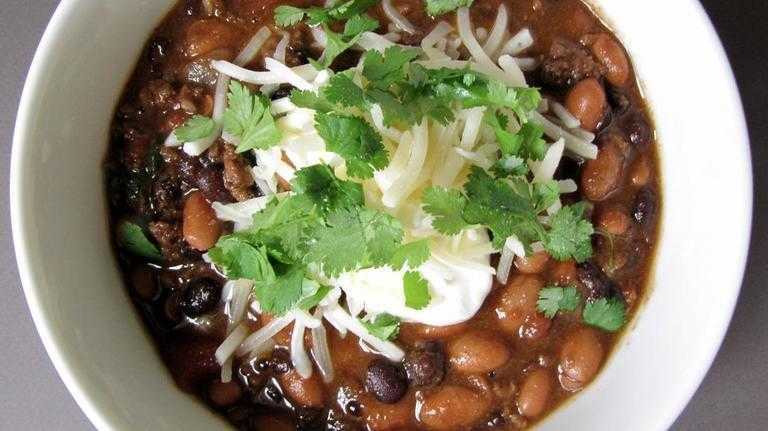 Top with sour cream, cheese, and more cilantro or whatever you desire on your chili.